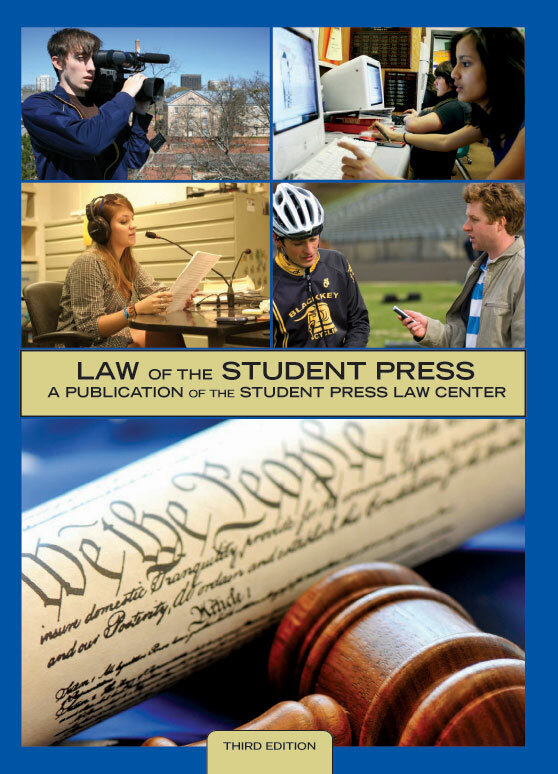 In preparation for its 35-year anniversary celebration, the Student Press Law Center has released the third edition of Law of the Student Press, providing an important resource book for student journalists. The Law of the Student Press was first published in 1984 and last updated in 1994, making this the first substantive update in 14 years. The book, which addresses legal issues regarding all forms of media, is authored by the legal staff of the Student Press Law Center and a nationwide team of media law experts. "Obviously, a lot has transpired over the past 14 years regarding student journalists' rights," said Frank LoMonte, an attorney who is the Executive Director of the Student Press Law Center. "New court rulings, new statutes, and the emergence of new media have all drastically changed the legal landscape - unfortunately, sometimes not for the better. Law of the Student Press explains what these changes mean and how they impact high school and college journalists, their advisers, and those who have an interest in student journalism. The book can be used for classroom teaching, but it is also meant to be used as a practical reference guide for journalists who need quick answers to legal questions," LoMonte said. The Student Press Law Center, a nonprofit organization that will mark its 35th anniversary next year, is the authoritative source on student press law. The center is based in the Washington, D.C., area and assists thousands of student journalists nationwide each year through its attorney hotline and its website, http://www.splc.org. Online publishing of off-campus speech, such as comments made on personal websites (MySpace, Facebook, etc. ), that is sparking a new generation of free speech litigation. The latest on how the Supreme Court's Morse v. Frederick case ("Bong Hits 4 Jesus") is impacting student First Amendment rights, and practical tips on responding to a censorship threat. A step-by-step description of the new copyright electronic filing system, and a detailed discussion about when the use of someone else's online content can safely qualify as a "fair use." In addition, Law of the Student Press updates traditional media issues such as libel, defamation, invasion of privacy and obscenity. It specifically addresses the different legal standards that may apply between college and high-school media, as well as between public and private schools. As a benefit to official members of the Student Press Law Center, work is underway to post a Wiki-version of Law of the Student Press in a secured section on the center's Web site, which will be updated as new laws are enacted and court rulings are issued. Members will be given a password to access the site. Information on ordering Law of the Student Press can be found at http://www.splc.org/losp3. Discounts are available for SPLC members and bulk orders. Since its founding in 1974, the Student Press Law Center has been the only national organization exclusively devoted to providing free legal advice and assistance to student journalists and journalism advisers, and serving as an advocate for their free-press and freedom-of-information rights. For an interview with an attorney from the Student Press Law Center regarding the Law of the Student Press, or a color pdf of the book cover, please contact Beverly Keneagy at bkeneagy @ splc.org with the request.